It had been a long journey for Marie in her battle with Pye Ltd, involving many years of burning the midnight oil; immersing herself in Patent Law; gathering the evidence of Pye’s infringement of her Patent covering the truncated sound reproducing stylus. A journey that had brought in its wake a lot of stress and upheaval for her and the family. Now finally she had reached her destination – the High Courts of Justice in the Strand, London. She was accompanied by her two eldest daughters, Dawn and Cynthia. As she strode through the cavernous building, she felt the excitement of the moment take hold of her. She searched the lists of court cases displayed in a glass cabinet in the great hall. There it was: Killick V Pye Ltd, to be heard in Chancery Division Court 2. The eminent patent judge, Justice Lloyd-Jacob would hold the outcome of her hard work and sacrifice in his hands. She felt confident that British Justice would not let her down. Here is an extract from Chapter 33 of A Sound Revolution. On Friday 20th of December, we were once more travelling by train to Victoria Station. With less than twenty-four hours notice, we were on our way to receive Justice Lloyd-Jacob’s judgement. Absorbed in a stack of technical papers, Mother sat quietly reading a point of evidence. She was still concerned that the absence of her former solicitor, Mr Kenneth Brown, in court would be a point in Pye’s favour. As we passed through the large doors into the enormous Hall of the Law Courts we were very aware that when we next stepped out into the Strand, a judgement would have been delivered. The tension was mounting; in just a few hours, our lives would be altered for better or worse. Mother had been told that, should judgement be found in her favour, Pye Radio would almost certainly take the case to the Court of Appeal. On the other hand, her legal advisors told her that if judgement were awarded in Pye’s favour, the Law Society would not necessarily extend her Legal Aid Certificate to cover an appeal. Mother brushed aside such worries, confident that victory would be hers, and we made our way to No. 2 Court. Her solicitor, Mr Dicks, met us at the door. Her Counsel, Mr Shelly, and his Junior, Mr Walker, were already in their places. As I took my place next to Mother, I threw a hostile glance in the direction of Pye’s Leading Counsel. Until the hearing, the enemy had been faceless; over the years they had become, to Dawn and me a shapeless monster, a dark menace overshadowing our lives. As I glared at Mr Johnson, I found myself wondering how anyone could defend such a ruthless organization. Surely, I thought, he could not be a man of honour and integrity. In reality, of course, to him, the case was just another brief; he was completely unaware of the pain and suffering Pye Radio’s infringement had caused our family. The court rose to its feet as Mr Justice Lloyd-Jacob entered the Court. Scrutinizing his face, Mother tried to glean some hint of his decision, but his expression was inscrutable. He bowed his head in acknowledgement to the court and sat down. As he did so, his eyes fell on Mother, to whom he gave a brief smile. Her heart raced, was he trying to reassure her that all would be well, that she would have cause for celebration that day? She hoped so! As evidence and prior art established, a number of proposals for special shaping of the needle tip had been made over the years, but the rapidity with which wear developed was such that no special shaping could make the needle remain effective for longer than about one playing, and made expenditure upon such special shaping uneconomical. Styli were also made of what is termed “sapphire”, which is a term of art for a synthesised solid of a uniform jewel, such styli were much more resistant to wear than steel needles and might be expected to work satisfactorily for hundreds of playings. In consequence, the shaping of the tip to secure improved performance or longer life was of greater importance, and it was to this, that the patentee in 1945 directed her attention . . .
And so the Judge meticulously went through the various points of law, and evidence, Mother gave her full attention to his every word, as did counsel for both sides. A lot of it was of a technical nature. Dawn and I, attracted by the various activities of the clerks and stenographers, found our attention wandering around the courtroom. A bright ray of light breaking through the December cloud outside, illuminating the particles of dust as they danced and swirled to the ground, caught my eye. “Two apparently independent manufacturers, Telefunken and Walco, reached this stage before the patentee and both adopted a spherical shape for the terminal. But for the patentee’s contribution, who could have supposed that a flat end would have emerged in this art, an emergence which, whether intended or not, in fact provided the solution for the so-called universal stylus when the problem of varying groove records presented itself. The defendants have called no evidence which helps me to appreciate how a person skilled in the art would, in approaching this question of stylus tip design, be led in any way to the patentee’s solution and I cannot hold that perusal of the cited documents suffices. At the Judge’s encouraging words, we looked at Mother to see if she was pleased with the way things were going. Her eyes were riveted on the Judge’s face. He had her full attention and from her slight smile, we could see that she was indeed happy with the way that the proceedings were going. “As far as concerns the attack on validity, the considerations already expressed in relation to the construction of the claim provide an adequate answer. If “standard” in relation to sound groove imports such dimensions as are standardised by manufacturers, these will include the contained angle of the groove as well as its initial width. It would therefore be as foolish for an instructed reader to seek to insert a stylus having a vertex angle greater than the included angle of the groove into such a groove, as it would be to seek to use a flat wider than the groove width or narrower than the bottom radius. Followed with intelligence, the requirements that the point is to enter the groove and only contact the side walls will effectively mark out the portions of the two dimensional ranges which are appropriate for any particular standard groove. Our hearts sank at his words; surely he was saying that Mother had lost the case. The tension in the court was almost tactile. My stomach churned inside, I hardly dared look at Mother, whose lips were compressed to a thin line, her face pale as she sat rigidly upright. The Judge’s words became blurred in Mother’s distress, and she could no longer make sense of the complexity of the technical jargon. Her knuckles were white, her hands tightly clenched and her whole body straining forward, intent and desperate to focus and make sense of the Judge’s words. How could she bear the pain if she should fail: her years of courage, her faith in British Justice, her hopes of victory, would lay in tatters at her feet. She had never doubted that Pye had infringed her patent; she wanted to shout this to the Judge. She felt sick, aware of the Judge’s voice, but his words were lost, for the moment, to her understanding. Uttering a desperate prayer, ‘Please God, don’t let them get away with it’, she struggled with her despair. A sensation of God’s peace cleared her mind and she felt extraordinarily calm. The tension eased and as she unclasped her hands the blood returned to them, the strain on her face replaced with a smile. I was puzzled at her change in demeanour but took hope from it. Mother’s attention returned to the Judge who was covering a point of evidence of the opposition’s expert witness, Mr Myer. His words had the effect of transporting us to unimaginable joy and Mother could not resist a glance at Dawn and me, who could see that her eyes shone with happiness. A smile of relief and victory was exchanged between us. I wanted to hug Mother and shout aloud, but that would not have been appropriate behaviour in such an awesome setting, and such exuberance would have to wait until later. We turned our attention to the man, who with the words of his judgement, had reinforced our faith in British Justice. It was over! A judgement had been given in Mother’s favour and a certificate of validity of her Patent had been granted – Pye Radio’s counterclaim to have her patent dismissed as invalid, had failed. I looked over to the opposition, curious to know how they were taking defeat. Mr Johnson looked unmoved by the whole affair and was busying himself with his papers. The other people sitting behind him, and obviously to do with Pye Radio or their solicitors, looked grave; but they had always looked severe and uninterested: indeed, they had ignored Mother throughout the case. Revenge, to Mother at that instant, seemed very sweet – a moment to be savoured after all that Pye had forced our family to endure over the years. 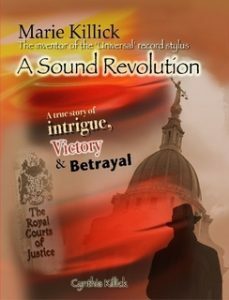 At Pye Radio’s confirmed guilt of infringement by the Judge, a shaft of light pierced through one of the high windows, filling the well of the court with its rays. To my mind it was like receiving a sign that God had put his seal of approval on the judgement. A fanciful childish thought, you may say, and in the cold light of day I may well agree, but at that moment, charged with the emotion of the day, it was an understandable assumption. When all the details were sorted out to the judge’s satisfaction, the case was closed and the Clerk of the Court asked the Court to rise. Everyone stood to attention as the judge made ready to leave the courtroom. Nodding to everyone in general, his eyes rested for a brief moment on Mother, she lowered her head in respect, but not before she returned the smile he had given to her at the beginning of the day. Our feet hardly seemed to touch the ground as we gathered our things together and made our way to the corridor outside. Everything seemed so unreal – words had been spoken and everything had changed. Mother shook Mr Shelly’s hand, thanking him for all he had done on her behalf. He in turn congratulated her on her victory. Mr Dicks and Mother talked briefly over a few points relevant to the inquiry as to damages before saying goodbye. The Court Ushers came up to her, offering her their congratulations. They were so pleased and wished her all the best for the future. We made our way down the stone staircase to the Great Hall. To my mind, even the gloomy portraits that lined the walls seemed less severe, almost echoing the congratulations of their flesh-and-blood Brothers-in-the-Law. The press reporters and their photographers were gathered outside in the winter cold, waiting for the victorious plaintiff to appear. They asked the usual things that one expects on such occasions, and Mother answered them with obvious delight. One reported asked if Pye Radio were going to appeal against the Judge’s decision, and she told them that the counsel for the defendants had asked the Judge for time to consider an appeal, and he had given them until the 20th of January in which to do so. She also confirmed that he had ordered an injunction against Pye Radio against further manufacture of her invention and a full enquiry as to damages, which would not take effect until after the 20th of January. She told the reporters that, should Pye Radio decide to appeal, then she was confident that the Appeal Court would uphold Justice Lloyd-Jacob’s decision, and that her victory would be confirmed. The rest of the day is a blur to us; it was as though a magic lamp had been rubbed and the genie had granted our every desire.